Today has looked a lot like the picture I posted above- we’ve been in the airport for most of it. Our originally plane was set to leave Manchester, NH at 6:20 am this morning, and we had planned to wake up around 3 am to drive to the airport. We were again using Southwest Airlines Vacations, which we had luck with when we went to Disney World last year. The phone rang this morning and it was Southwest Airlines saying our flight was delayed due to mechanical difficulties. Our flight would be postponed until 11:20 am this morning, which would mean that we would miss the connection flight from Chicago Midway to Las Vegas. On the phone, the Southwest Airlines representative assured us that they had already figured out new flights to get us to Las Vegas on time. We took their word, but then realized that Southwest Airlines may be promising something unrealistic. We called the in-flight helpline- who tried to figure out and finally found us new flights. We were initially scheduled to arrive in Las Vegas 12:30 pm local time. 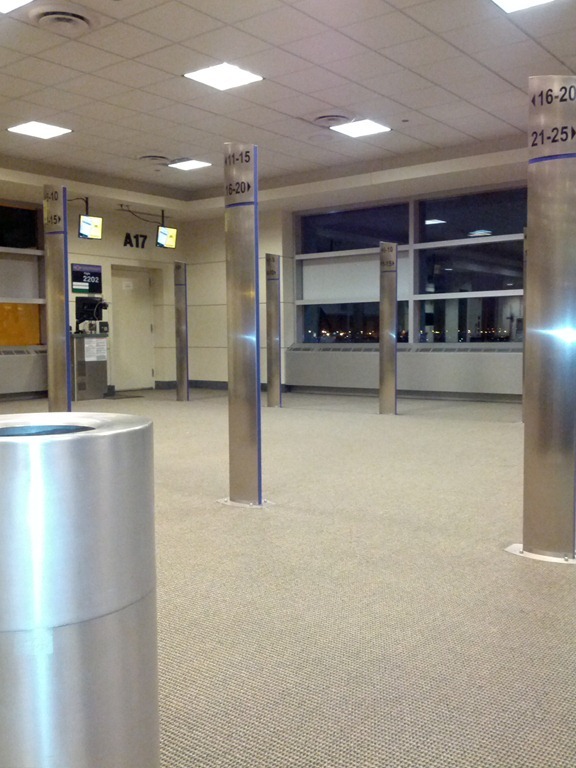 Our new flights place us in Las Vegas at 10:55 pm, many hours later. I’m writing this from the Chicago Midway airport, which we’ve been sitting at for the last 6 and a half hours. On top of it all, we have another layover in Denver, CO.
Southwest Airlines frustrates me with some of their policies. It’s frustrating that we are not instantly credited- we paid a premium to get a 1 layover flight. It is certainly not my fault that your plane malfunctioned- and that it was promised that my itinerary would be fixed when it wasn’t. It’s not my fault we took off 5 hours later than we needed to. But now I am the one that has to sit in the airport for 7 and a half hours because of your incompetence. We were looking forward to spending the day in Las Vegas, not in Chicago, sitting in the airport waiting around. Loading the Plane- It’s cool and all that you have free seating, I can dig that. But it’s ridiculous to have those who get in the plane first sit at the front, and those of us at the end have to walk the length of the plane to find overhead storage and seats. Preboarding- I know that when I have a family, this will be a perk. I get that people have disabilities and need extra time boarding. But there are also people that chronically abuse the system. The rule should be that if you need extra time, you need to be the last ones off the place. I mean obviously you’re going to need more time each way, so don’t waste my time getting off the plane if you’re getting the perk of being able to board ahead of me. Credits- When something is Southwest Airline’s fault, credit me immediately. You drive a hard bargain if I were to be running late, and tell people that they are out of luck. Why doesn’t Southwest Airlines instantly credit me back the purchase amount because it is your fault. I hope we are able to enjoy the rest of our vacation, which was cut short due to Southwest Airline’s lack of planning ahead.